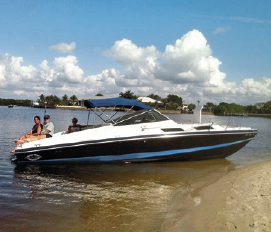 Check out Bob and Patti May’s testimonial about their Magnum 27 Sedan and Magnum 35! I love Magnum so much that I own two of them. It all started when a friend of mine bought a brand-new 1972 Magnum 27 Sport. I was hooked but had no money. Through the course of my life I was finally able to buy a 23’ Formula, an 18’ Donzi, a 24’ Superboat and finally, in 1986, I purchased my first Magnum—a 1973 27’ Sedan which I still own and decided to bring to Punta Gorda, Florida, where I own a home. When I retired in 2005 I said to my other half, Patti, “See if you can find a 35’ Sportfish,” and she did in Morehead City, North Carolina. We flew to North Carolina and we purchased it that same weekend and it has been an ongoing love affair since—hence the name Cha-Ching. Unfortunately, boating in New York is seasonal, but when she’s in the water we spend every weekend on her in the Long Island Sound and because of the vast cockpit on Cha-Ching we are always the host vessel when rafting with our friends.